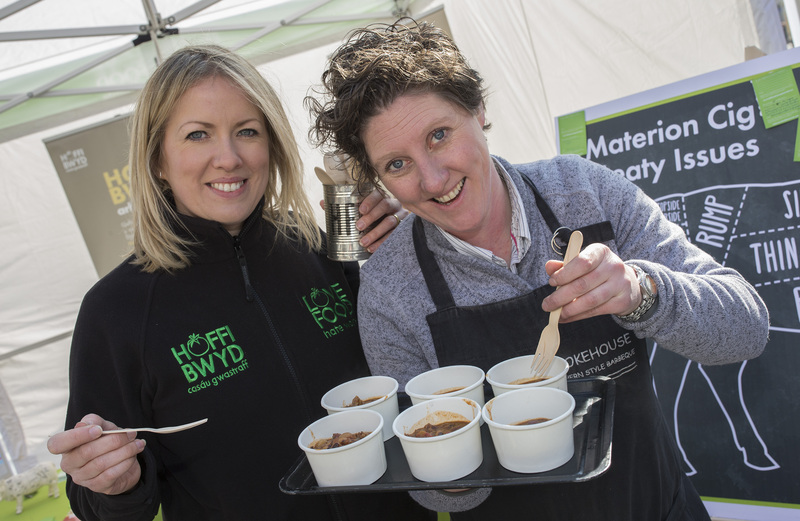 Love Food Hate Waste joined forces with award-winning pop-up restaurant Hang Fire Smokehouse to show the people of Cardiff how to use their leftover beef, as its new campaign reveals that every year people in the UK throw away 34,000 tonnes of beef – the equivalent to 300 million beef burgers. 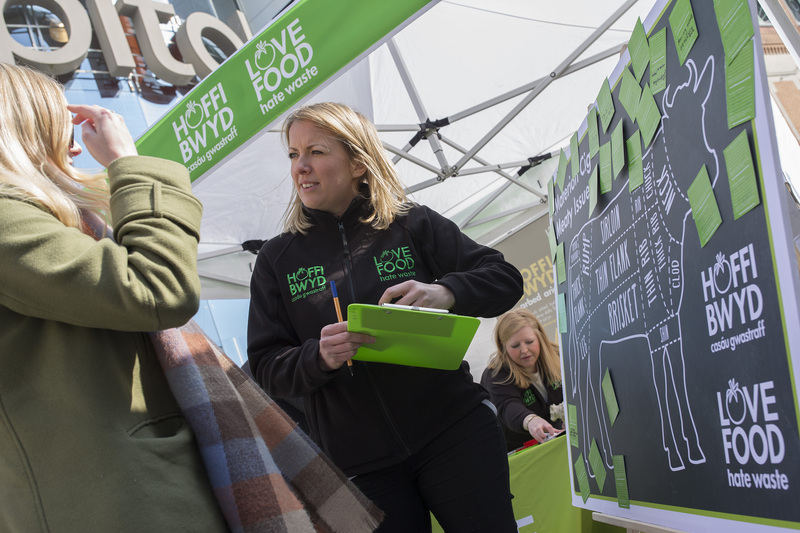 On 14 March, Samantha Evans and Shauna Guinn, the duo behind Hang Fire Smokehouse, joined Love Food Hate Waste for a pop-up demonstration on Cardiff’s busy Queen Street, giving the public tips on how best to use their beef leftovers, as well as free tasty treats using cooked beef commonly wasted by consumers. Research carried out by Love Food Hate Waste, an organisation that aims to raise awareness of the need to reduce food waste and help the public take action, shows much of the waste, worth £260 million annually*, could be avoided by taking simple steps, such as planning meals in advance, understanding date labels, storing food better, serving the right portions and cooking with leftovers. Visitors to the stand who make a basic pledge to change the way they use meat at home to avoid waste, such as planning meals in advance, will be entered into a prize draw to win a kettle BBQ worth £100. The first ladies of ‘cue, who recently opened the doors to their permanent home in Barry, The Hang Fire Southern Kitchen, will bring their custom built Argentinian Parilla grill, BB King, to Cardiff’s streets to cook up some quick recipes using cooked beef. Caroline Hutchinson from Love Food Hate Waste said: “Our research has shown that despite our love of beef, we still throw away hundreds of millions of pounds worth every year in the UK, with a weight equivalent to 300 million burgers (alternatively this is the weight of 150 million steaks†). According to a new poll, just under one third of people who buy beef in Cardiff (31%) plan their meals in advance and purchase only the amount they need. But beef is popular in Cardiff kitchens – a traditional roast beef dinner and spaghetti Bolognese were named the city’s favourite beef dishes and 22% (respectively) picked them as their most frequent beef dishes to eat at home. This was followed by a steak dinner (12%). However, not everyone gets around to using it all up. One in six (16%) Cardiff residents who bought beef said it had gone to waste as they had left it to go past the use by date. 7% admitted they’d thrown it out after leaving it uncovered or in an open packet. The quality of the product (22%) and suitability for a recipe (26%) were the two most important factors to shoppers when buying beef, while 14% of people in Cardiff were tempted by a deal or special offer. · Leftover roast beef doesn’t have to be used just in a sandwich – it works brilliantly in a cottage pie, a soup or shredded and added to a stir-fry. · Not enough beef to go around? Add some chick peas or kidney beans to Mexican meals or curry to make dinner more filling and save money on meat. · Remember to check date labels so you know when your beef needs to be used by. · Going shopping for beef? Plan ahead by using Love Food Hate Waste’s handy portion planner to get the perfect amount. · If you’ve found a great special offer or don’t want to use all of your beef at once, freeze some for another day and use when needed. · It is perfectly OK to freeze cooked meat and small portions freeze best. Then it can be added from frozen to your dish. The most important thing is to ensure that when you are reheating the meat that it is piping hot all the way through before serving. · Check out Love Food Hate Waste’s recipe finder for ways to use smaller portions and cheaper cuts to make delicious meals. · Before roasting a chicken, cut the wings off. Wrap them tight and freeze them. After three or four roasts you’ll have enough wings to cook for another meal. · Freeze leftover sausage to make tasty sausage rolls. · If you buy a big pack of bacon, rashers can be frozen easily by putting greaseproof paper between them. Then you can cook from frozen whenever you are treating yourself to a weekend fry-up. · Marinades are a quick and easy way to pep up meat that is almost at its use-by-date or has been in the freezer for a while. Just put chicken fillets, beef steaks or chops in the marinade for about 30 minutes in the fridge, turning once. · For a chicken marinade, use soy sauce, honey and mustard. For beef try chilli flakes, ginger and coriander and for lamb use garlic, rosemary and lemon juice. · Leftover Sunday roasts can be made into tasty money-saving dishes like lamb rogan josh, Moroccan chicken stew or roast sausages. · Eat from the freezer one night a week. · Take a ‘shelfie’! Taking a picture of your fridge before you go shopping means you won’t be doubling up on items you already have.